The adage goes that the worst day’s fishing is better than the best day at work. So what does that make a Friday of pulling up kingfish after good-sized snapper on a pristine New Zealand coastline, chauffeured by helicopter? “It’s fabulous stuff, isn’t it?” says accountant Brent Dickins, rod in hand on the rocks of Great Barrier Island. Dickins’ rod takes a sudden, violent dip, ” … and here’s another one”. A couple of hours earlier Heletranz pilot Steve Clarke put us down at one of his secret spots somewhere near Okiwi Station: Four fishermen-passengers and one lucky journalist, invited along to make up the numbers. 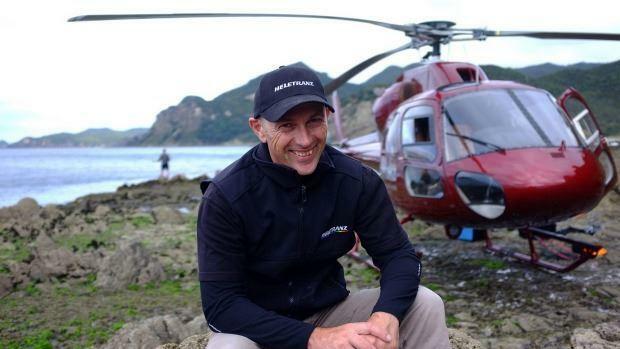 It was a 30-minute ride by helicopter out to the Barrier from Albany over Tiritiri Matangi Island, and the chopper is now perched on rocks that are underwater at high tide. The men are keen to get lines in the sea and, as our guide rigs up the 3-metre graphite rods, he warns that if anybody hits a rotor they have to buy him a beer. Clarke also lays down the rules that any snapper under 33 centimetres, or more than 7.5 kilograms, gets thrown back. The big ones can be 60 years old and are tough to eat, he says. Kevin Fish is first to cast and within five minutes the man from Huapai is reeling in his first 3-kilogram snapper. “Perfect eating size,” he says. Truck driver Fish says he is “bloody grateful” to his boss Shane Hegh for his $850 place on the expedition – a Christmas gift in appreciation of a decade of loyal service. “Even before getting shouted this he was good to work for,” Fish says of Hegh, who’s within earshot. “It is basically what I expected. Hang on, I’ll just grab this fish,” he says, as the reel spins out yet again. Our pilot-guide has hardly a spare moment as he hustles around after the fishermen, re-rigging snagged lines, ferrying the catch back to the chopper, throwing out the berley, and divvying out the sandwiches. Clarke’s been flying for about 15 years, and most of that time he’s been taking people fishing. The kind of people who go heli-fishing are often corporates entertaining clients or tradesmen, he says. Residential construction manager Craig Champness of Dannemora munches on a sandwich as he says the joy of the day is in the easy access to an untouched coastline that has no cellphone coverage. It’s not about catching the biggest fish, he says. But it’s Champness who pulls in the largest snapper of the day – and who also takes home the tale of the one that got away. The heli-fishing season runs from early autumn to December, after which the water heats up and the snapper swim into the inner Hauraki Gulf to spawn. Within that window there are about 10 days a month that the moon and tide play ball, he says. After about four hours fishing around the low tide, another half an hour and the waves would be at the chopper’s landing skids. As the rain and tide close in and the wind picks up, the heavy chilli bins full of nearly 30 fish to load back into the cargo hold, mostly snapper but also a couple of kahawai. On the trip back, the central business district of Auckland rises as we head back to Albany at an altitude of 1500 feet. “It’s a beautiful city from here,” Clarke says through the headsets.